I don't think islander fans are going to flock to the railroad as a means of getting to games. No, no conflicting movements over switches. I was speaking of using the three northernmost tracks for Main and Hempstead Line trains. No local stops on these three tracks between Jamaica and Bellerose so there is enough capacity to get all the peak direction trains through on two tracks and all the reverse-peak trains on the other (exceptions could be made during low-traffic hours and especially for employee stops at Hillside). I propose the FBA - Belmont service to use the southernmost track in both directions, stopping at Hollis and Queens Village, and adding double-track sections or using the sidings already in place on the south side today. This could most probably include a two-track island platform on the south side of the railway ROW at Queens Village for scheduled train meets, replacing the current MoW yard lead track and existing eastbound platform. Hollis could then have most trains stopping on the single south platform (eastbound today). West of Hollis station platform, a crossover to the northernmost yard/lead track is required for delay mitigation. This way, single-track operation between Jamaica and Belmont with trains normally meeting at Queens Village would allow for three trains per hour and direction. More would be possible if the Hillside lead tracks are excessively used for that purpose, but that would most probably negatively impact on the operations in the facility. At the west end of Hillside facility, east of the Babylon Branch flyover, the three express tracks for through trains would become the four we know today with the two Babylon Branch tracks in the middle at the entry into Jamaica station. Add a couple of #24 crossovers so trains can change tracks at speed there. 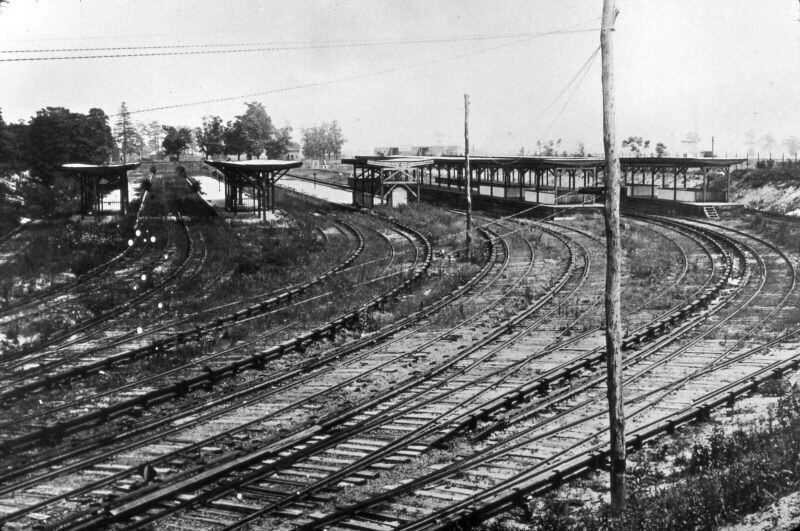 The FBA - Belmont trains would use one of the two Hillside lead tracks from there into Jamaica station. The Jamaica reconstruction is not questioned at all, I was thinking of making the FBA - Jamaica shuttle - which is a result of the Jamaica capacity enhancements - more valuable. Every second train from FBA could run to Belmont, every other terminating at Jamaica, with FBA - Jamaica service every 10 mins at peak and every 15 off-peak, for example. @ExCon90, yep, you got me. Although I do not see too much complexity even in HALL interlocking: The Jamaica complex restructuring provides for conflict-free routings for both directions of all four "lines" (Main Local, Main Fast, Atlantic/Valley Stream, Montauk from outside to middle) into or out of one of Jamaica's eight station platform tracks. I am proposing to use the existing connection to Hillside as a "fifth line" independent from the others. Anyways, nice idea to use the Montauk flyover for Hempstead trains! Its been noted that the station was previously south of Hempstead Avenue. I'd assume where the large parking lot is. This makes me wonder about something I've always questioned regarding the Cross Island Parkway underpass at Hempstead Ave. I've always thought it was odd and not typical of construction of Robert Moses Parkways. Also noticing that it is directly in line with the LIRR Belmont Station. Was this underpass previously used by the railroad to carry the tracks to the former station? BuddR32 wrote: Question about Belmont Station: Its been noted that the station was previously south of Hempstead Avenue. I'd assume where the large parking lot is. This makes me wonder about something I've always questioned regarding the Cross Island Parkway underpass at Hempstead Ave. I've always thought it was odd and not typical of construction of Robert Moses Parkways. Also noticing that it is directly in line with the LIRR Belmont Station. Was this underpass previously used by the railroad to carry the tracks to the former station? The Hempstead Avenue span over the parkway is concrete and typical of Moses construction. But the ramp underpass does look like a 2-track line. In fact it does resemble a Moses built rail structure: East New York Station. This should be where the parking lot is today, correct ? newkirk wrote: This should be where the parking lot is today, correct ? Your photo view south from Hempstead Tpke Overpass. What is the date on this photo? Google shows a parking lot! Anyone with a post 1957 track map? nyandw wrote:What is the date on this photo? There is no date on the slide mount. Even though the photo is black & white, there are many tuscan red cars and at least one gray car. That may give a clue to when this photo was taken. Hi Bill, Dave Keller indicates: 'I have several images similar to this in my archive. This was shot during the transition era . . the cars are mostly Tuscan Red with a Tichy scheme in the background. All mine are similar and were shot in 1949-50. I'd say the same dating would hold for this image." nyandw wrote: Hi Bill, Dave Keller indicates: 'I have several images similar to this in my archive. This was shot during the transition era . . the cars are mostly Tuscan Red with a Tichy scheme in the background. All mine are similar and were shot in 1949-50. I'd say the same dating would hold for this image." Thanks Steve and Dave. Any idea when that yard was closed and torn up ? 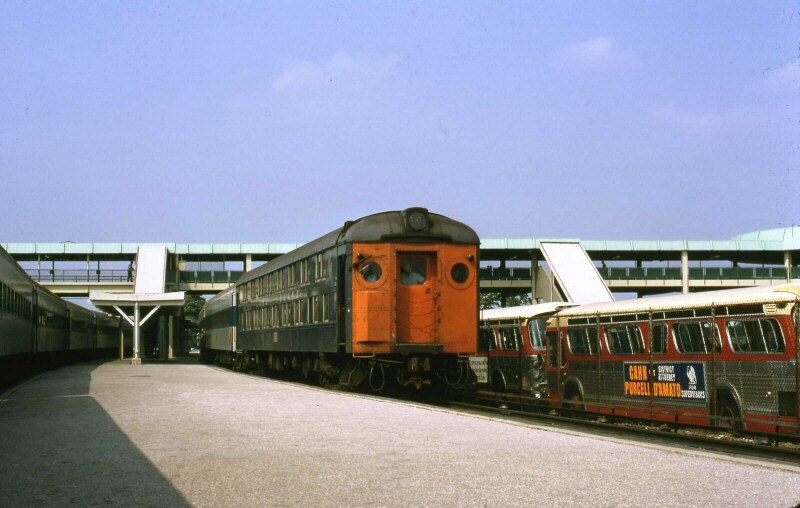 That's the first time I ever saw this photo of steam & MU electric sharing the original terminal. If you would like to see a lot of this area, you should go to the Fairchild aerials site. I found over a dozen photos of Belmont and the surrounding neighborhood of Elmont.